A BUBBLING CAULDRON: Three More Police Recruits Graduate! 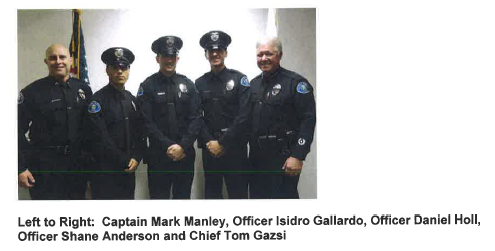 In a press release today the Costa Mesa Police Department announced the graduation of three new officers from the Police Academy yesterday. New officers Shane Anderson, Isidro Gallardo and Daniel Holl will now join the CMPD and begin their training with a Field Training Officer. Congratulations to all three men and welcome to Costa Mesa. Welcome to Costa Mesa! The city needs you. Thank you, Chief Gazsi, for your continued efforts to rebuild our security. I look forward to a replenished police force and the return of our proactive policing. Thank you for having the faith in the good citizens of Costa Mesa. This vile council majority has caused and promoted a toxic atmosphere at 77-99 Fair Drive.